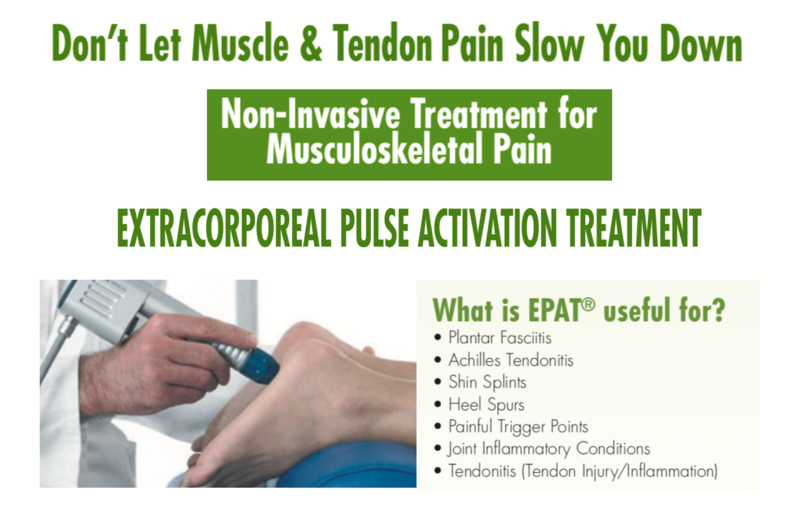 EPAT® is a type of Shockwave therapy that delivers pulses of sound waves that cause “microtrauma” or microscopic injury to the soft tissue and bone it is treating. This trauma stimulates inflammation, which is critical to healing. It also helps to stimulate blood flow to the area. Damaged tissue begins to regenerate and eventually heal. The beneficial effects of Extracorporeal Pulse Activation Treatment (EPAT®) are often experienced after only 3 treatments. Some patients report immediate pain relief after the treatment, although it can take up to four weeks for pain relief to begin. The procedure may eliminate pain and restore full mobility, thus improving your quality of life. Over 80% of patients treated report to be pain-free and/or have significant pain reduction. It is important to understand that not all injuries will respond to EPAT®. Some injuries are too advanced and other treatment methods may be necessary (including injections and surgery) for pain relief. Yes. This FDA cleared technology was developed in Europe and is currently used around the globe. A wealth of medical experience, state-of-the-art engineering, and optimal quality have been built into each EPAT® device, and extensive clinical studies and tests have confirmed its safety and efficacy. What will happen after the treatment/procedure? The safety and effectiveness of the EPAT® procedure have not been determined on people with the following health conditions. Your doctor will provide you with information about how these and other conditions might affect the determination to perform the EPAT® procedures. EPAT® has a proven success rate that is equal to or greater than that of traditional treatment methods (including surgery) and without the risks, complications and lengthy recovery time. EPAT® is performed in our physician's office/clinic, does not require anesthesia, requires a minimal amount of time, patients can bear weight (i.e. walk) immediately, and return to normal activity within a few days of the procedure. No incision. No risk of infection at the treatment site. No scar tissue formation. Over 80% successful outcomes published Data-Long- term pain relief (Results retained). Non-invasive so biomechanics are not affected, and future treatment options are not limited. Reduced cost of lost work. The non-invasive EPAT® treatment has virtually no risks or side effects. In some cases, patients may experience some minor discomfort which may continue for a few days. It is normal to have some residual pain after intense exercise or a full-day of work. Will my insurance cover EPAT® treatment? The world of technology that we live in today offers many benefits for us. The world of medicine has benefited greatly from improvements in medical technology and techniques in the recent years. Approximately two years ago the FDA approved a type of shockwave therapy that can be used to help people with painful heel condition called plantar fasciitis. This technology, while offering the foot an ankle specialist yet another treatment option for a patient suffering from plantar fasciitis, should be understood in both the mechanism in which it works and what exactly it is treating for this condition. Plantar fasciitis is a very common condition among all ages, sexes, and ethnicities. He is a condition where long ligament type structure that to exit the heel and connects to the metatarsal heads (also known as the ballad of the foot), gets irritated and inflamed. Patient's often complain of pain that is the worst in the morning when getting out of bed, the pain then improves slightly as they get up and begin to walk around, but does not completely go away. Often if the patient sits down during the course of the day and gets back up they noticed a spike in the pain. Quite often by the end of the day the patient's heels are very sore. 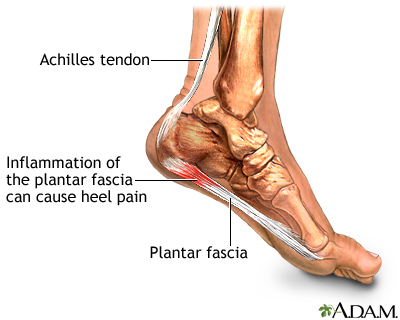 The reason for this cycle of pain as that usually there is a mechanical stress and strain that is placed on the fibers of the plantar fascia where it attaches to the heel. The pain is typically most intense towards the inside of the heel because the tension of the ligament band is at its highest at this point. The key component of understanding his condition is that the cause of the problem is usually the foot type involving the structure of the foot that the patient has. There are 2 extremes with this. At one and of the spectrum is a person with an excessively pronated (flatfoot) foot type. In this type of foot. A patient's arch flattens out and pulls on the plantar fascia, thereby causing microscopic tears and elongation of the fibers. At the opposite end of the spectrum is the rigid high arch foot type. This is the foot type, whereby the patient has a very accentuated arch and when they stand the arch does not have any flexibility thus providing no shock absorption with weight-bearing. Not only can the patient get pulling of the fibers, but when a patient with stiff foot down as they are walking or running. There is no flexible adaptability of the foot to the surface that the person is walking on. Again, this results in pain and discomfort. It is also common to have a simultaneous condition of tight muscles in the calf. This tightness in the calf causes a loss of range of motion of the ankle joint beneath the ankle call the subtalar joint. When the joints do not have their full range of motion mechanical stress and strain is put on the surrounding tissue and the proximity of the plantar fascia to the subtalar and ankle joints makes it a perfect anatomical structure to be subjected to this extra mechanical stress and strain. With this in consideration, it is important that patient understand that a vital part their treatment plan includes proper support of the foot with the use of a custom molded in-shoe orthotic in some cases, minimizing barefoot walking and a proper stretching program for the calf muscle if tightness is found to be a major factor. Treatment, in general, is the two-fold involving treatment of the inflammation of the ligament and mechanically reducing stress on the bottom part of the heel as well as tension from the back of the heel involving the Achilles tendon and calf muscle. Secondary to addressing the mechanical causes of the patient's pain is the pain itself. Since it is an inflammatory condition, there is a multitude of options for controlling inflammation. The patient may utilize an oral anti-inflammatory medication, have an anti-inflammatory injection in the area of the plantar fascia where it attaches to the heel, receive physical therapy modalities such as ultrasound, deep tissue massage, electrostimulation with cryotherapy or a home program with icing of the area several times per day to help minimize inflammation. It is important for patient to understand that if they are only receiving treatment for the pain itself and not having any of the mechanical issues addressed, despite the fact that they may see improvement or resolution of the symptoms, he may have a relapse of recurrence of the pain due to the fact of the cause of the pain was never addressed. With these factors being brought to light, it is important to understand the purpose of OssaTron shockwave therapy for chronic plantar fasciitis. It is hypothesized that the scar tissue and inflammatory tissue that formed within the band of the proximal plantar fascial ligament secondary to the micro-tearing of the fibers ddonot have the same quality or quantity of blood flow as a normal healthy tissue. Therefore, due to the relative inability to be able to deliver oxygen and other nutrients and the inability to get rid of waist byproducts of the body metabolism, the discomfort in these areas tends to be greater. The purpose of the shockwave therapy is to actually mechanically break up the chronic scarred inflammatory tissue. The proposed mechanism of decreasing pain is at the disruption of the chronic inflamed scar tissue causes of the phenomenon on his angiogenesis. Angiogenesis is the formation and growth of small new blood vessels in the area. By being able to deliver oxygen and other nutrients to the area and get rid of waist byproducts of the body metabolism, the tissue in this area can live in a "healthier state". The secondary benefit of having healthier tissue in this area is decreased pain or the elimination of pain. Currently, the recommendation for treatment would shockwave therapy for plantar fasciitis involves an individual having not been successful with previous conservative treatments for greater than 6 months involving cryotherapy, injection therapy, anti-inflammatories, physical therapy modalities, orthotics, foot strappings, and night splints. Due to the fact that this is a mechanical shockwave type of treatment. It is best performed under local anesthetic. This treatment is available in the office setting but typically is not covered by health insurance. The total time of treatment requires approximately 15-20 min. The studies involved with this treatment during the FDA trial shows that it can take up to 12 weeks for placement the rifle benefit from this treatment. During the patient's postprocedure recovery period, at least for the first 4 weeks is recommended that the patient is to not engage in any high-impact activities such as running, heavy lifting, heavy housework or yard work. It is also important to note that the shockwave therapy is treating the effects of the adverse effects of mechanical causes. Because he is treating the aftereffects, the mechanical causes cannot be more. With this translates into is that of the patient must continue to participate in any type of treatment to address their mechanics, such as using proper shoe gear with the use of orthotics, stretching of tight calf muscles, and cryotherapy. Human experience with this to date has shown that the vast majority of patients have rated treatment as successful, where success is indictated by the decrease or elimination of heel pain. In the remaining patients who have not experience an excess of one treatment, some patients have undergone a second treatment definably reach clinical success. If you've suffer from chronic heel pain and are considering shockwave therapy, please consider the factors mentioned above. Please understand that in 95-99% of the cases the reason for the plantar fasciitis is mechanical, i.e., flat feet, excessively high arched feet, tight lower extremity muscular. Shockwave therapy only address his inflammation. It does not change the mechanics of the foot or lower extremity. In order to experience long-term success, the patient must understand that there still must support either flatfoot or rigid high arch foot and maintain proper range of motion and flexibility of the lower extremity musculature. It is not too dissimialar to an individual who undergoes coronary artery bypass surgery who has to realize that at their bypass surgery, if successful, must make changes in her lifestyle. Poor lifestyle choices usually were typically the cause of the problem or acceleration of the problem in the first place, i.e., sedentary lifestyle, smoking, alcohol use, poor dietary habits. The most important message involved in treating the heel pain is that it cannot be only treatment of symptoms because that will only be at best provide short-term relief with no long term resolution and a high likelihood of recurrence of symptoms if the mechanical issues are not addressed.